"Such recklessness wouldn't look out of place in a stock-car race. The only option now is for the US government to call a halt to Shell's plans to open up the frozen north because the company is so clearly unable to operate safely in the planet's most extreme environment,” said Ben Ayliffe, senior Arctic campaigner at Greenpeace, to The Guardian. He added that over the past two months no evidence has been seen that supports the assertion that safe drilling can be carried out in the Arctic. 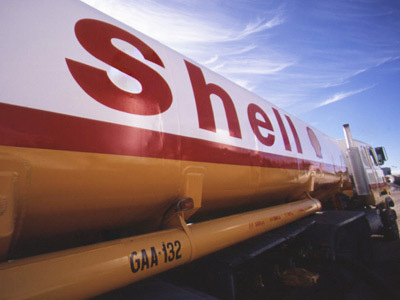 Shell got the go-ahead from the Environmental Protection Agency to begin work in the Chukchi Sea, off the coast of Alaska on Friday. The project had previously been blocked by years of litigation over environmental concerns. Greenpeace’s claims pertain to the lack of sufficient field-testing of a piece of apparatus known as a “capping stack,” designed to cap a stricken well and prevent a leak. The environmental organization says that more thorough testing is needed given the extreme conditions in the Arctic. “Alaska has over 40,000 miles of coastline – more than the rest of the US combined – and an oil spill would have a catastrophic impact on local wildlife and fishing,” said Greenpeace on their website. Environmental groups say that a spill of the same magnitude as the Gulf of Mexico would be catastrophic for the fragile region. They added that Shell’s limited testing of their equipment displayed a "total disregard" for safety standards. Shell officials contest this and say there is very little chance of a repeat of the Gulf of Mexico catastrophe. The company maintains that the drilling will not be as deep and as such they expect the wellhead pressure to be less. Shell’s Alaska spokesperson hailed the commencement of drilling work in Chukchi Sea as “historic,” extolling the benefits of the project to Alaskan communities. "It's the first time a drill bit has touched the sea floor in the US Chukchi Sea in more than two decades," Pete Slaiby, Shell Alaska’s vice-president said in a prepared statement on Sunday. 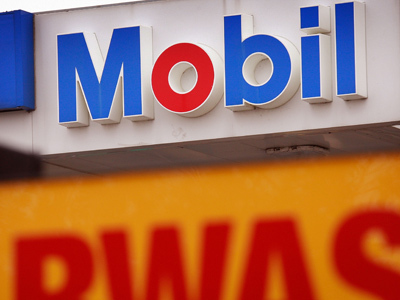 "This is an exciting time for Alaska and for Shell. We look forward to continued drilling progress throughout the next several weeks and to adding another chapter to Alaska's esteemed oil and gas history." 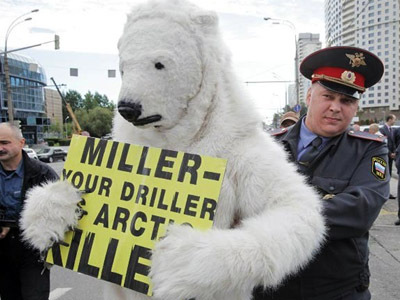 Greenpeace is not the only organization to have voiced concerns over Shell’s activities in the Arctic. In addition to questioning the company’s safety measures, doubts have also been raised over the pollution the new drilling project will create. The US environmental protection agency (EPA) granted Shell permission to begin drilling work on Friday despite the fact that the company is expected to violate environmental regulations there. Shell had previously informed the EPA in June that it was unable to meet the air quality guidelines in place and asked for EPA to lift regulations for the company’s drilling project. 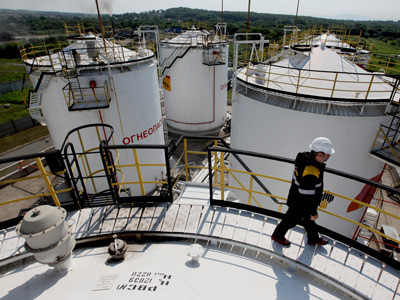 The agency said that until Shell’s formal request to loosen regulations in 2013 is assessed the current emission limits "remain legally in place." Any modifications to emission guidelines will be temporary assured the EPA. In response to Shell and other large oil companies extending their activities into the Arctic, Greenpeace has launched the ‘Save the Artic’ movement. The group claims that the chances of a major environmental catastrophe are distressingly high, given that the technology for working in extreme Artic conditions is not advanced enough. Greenpeace has collected more than 1.7 million signatures on its website against further development in the polar region. 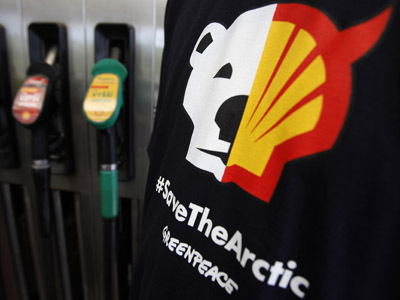 “Shell has spent $4 billion buying its way into the Arctic, but now a global movement is mobilizing to protect this region for good,” said Greenpeace Senior Oceans Campaigner Jackie Dragon. Shell and other large oil companies maintain that they have the technology to extract oil from the Arctic without damaging the fragile ecosystem. Moreover, they argue that the area’s rich oil reserves are the only to meet the world’s rising fuel needs.